Christmas is without a doubt my favorite holiday! As a result, I like to celebrate all month long, especially now that we have Noah. I love creating traditions for him that he will hopefully love and remember for years to come. It may seem like overkill, but we do a few different kinds of "countdowns". These "countdowns" don't just happen, they require some planning and preparation. In order to be ready to start right on December 1st, I need to get everything ready in November. Good news is, if you like any of these ideas, you still have time! We started most of these traditions in 2013 for Noah's "second" Christmas, when he was 13 months old. That Christmas, we started 25 Days of Books, where I wrapped 25 Christmas books for Noah to open and read each night. We loved it so much that we did it again last year and will do it again this year. This year however, I updated a few of the books with some more age appropriate books (new books are marked with an asterisk). The first two years involved lots of picture and board books. This year I made sure to get some longer story books that I think Noah will really love! Since books aren't cheap, I would suggest collecting the books slowly. Maybe the first year, just have enough books for you to do this on the weekends. Then you can ask for books as gifts and watch to see if they go on sale. Most of these books are the kind that your children will love to read year after year. I also don't see a problem with wrapping a library book... it gives the child the same excitement of opening and reading a new book without the added cost of buying it. And finally, I also make an Activity Advent of sorts for us to do as a family. In case you are interested, here are my past December Bucket Lists (2014 and 2013). This year, I went through the calendar, added our "events", added some crafts I'd like to do with Noah, and filled the rest with some random Christmas activities. They range from super simple to more expensive and requiring purchasing ahead of time. Do you have any fun traditions that you do with your family to help get into the Christmas spirit? Oh my gosh, you guys are going to have SO much fun this Christmas!!! I'm doing the 25 books of Christmas too but have yet to wrap them. I bought a few extra books this year and have a few in my Amazon cart (hoping for a sale!) and think I may need to add a couple of these too. And you KNOW we got the Paw Patrol Christmas one! I love these books and all of the fun activities!! I am in the process of creating our Advent calendar "schedule" and it includes a few books, but I am definitely adding some of these to the list!! Thanks for sharing! Yes! I love that you do your own "Advent Spectacular". It is my absolute favorite thing to do all year long. We've started planning ours. It's fun as the girls are getting older, we get their input now of what they would like to do and they help us come up with ideas to make it magical for James. This weekend I'm laying it all out on my calendar. GREAT list, definitely bookmarking this for ideas..!! 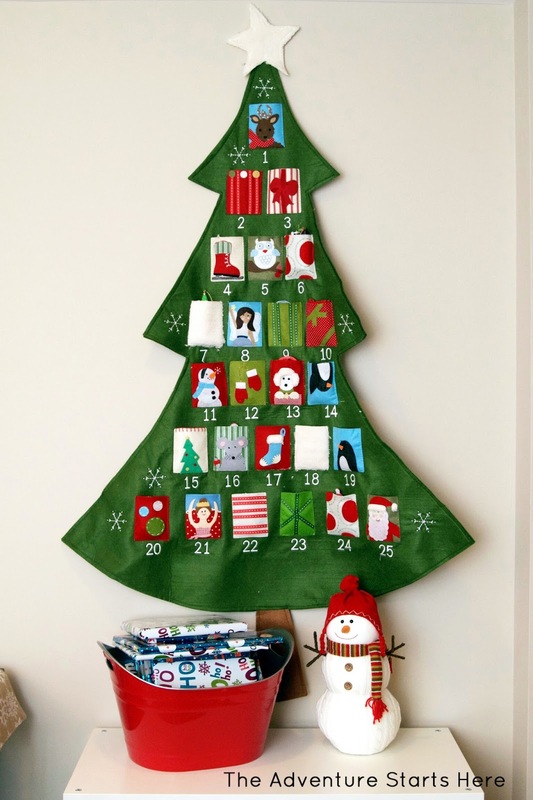 :) I need to get an advent calendar as I think Tyson would especially look forward to each day. Love your tree one!! Girl, we are meant to be friends!!! I do the same things and LOVE it!! Christmas is so much fun and I can't wait to get going with all of the festivities!! These are great books! I will be adding some to my list! How do you not have The Grinch?! That is a classic! I just bought Liam The Jolly Christmas Postman, and I can't wait to read it! We also really The Animal's Santa. Loving yalls activity list too! Can't wait to add some of those to our list. Ohhhh and I lol'd at Noah and his post-its!! Lily is always stealing mine and scribbling away! I Officially Have a 3 Year Old!